Nowadays, all the phone users are trying to figure out ways to make their iPhone full of their own styles, and making some customized ringtones will be the first change they want to make. The customized ringtones can be ripped from a song, or completed created by the users themselves. They are able to add these ringtones to iTunes library, and then sync them to their iPhones. Some iPhone users will choose to purchase some fantastic ringtones in the App Store, and download them to their iPhones. Both of the methods can make the iPhone different from others’. The post will you how to transfer purchased ringtones from old iPhone to new iPhone(including iPhone 6/6s/SE) with iTunes, and transfer customized ringtones with other solutions. Following the guidance below to know how to transfer ringtones from iPhone to iPhone. 1. Start iTunes, and go to “Edit > Preference > Devices”. 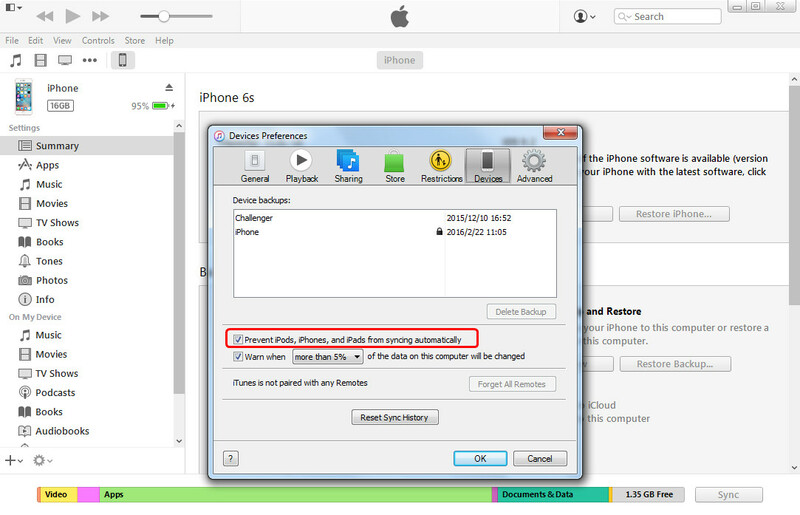 Check “Prevent iPods, iPhones and iPads from syncing automatically”. 2. Connect your iPhone to PC via USB cable, then double click on the iTunes icon to launch the iTunes app on your computer if it did not start automatically when your iPhone is connected to computer. 3. Click “File > Device > Transfer Purchases” at the upper corner. Then click “Apply” at the right bottom. iTunes will automatically sync the transferred items to iTunes library, and the purchased ringtones will be transferred back as well. 4. Then disconnect the old iPhone from computer. 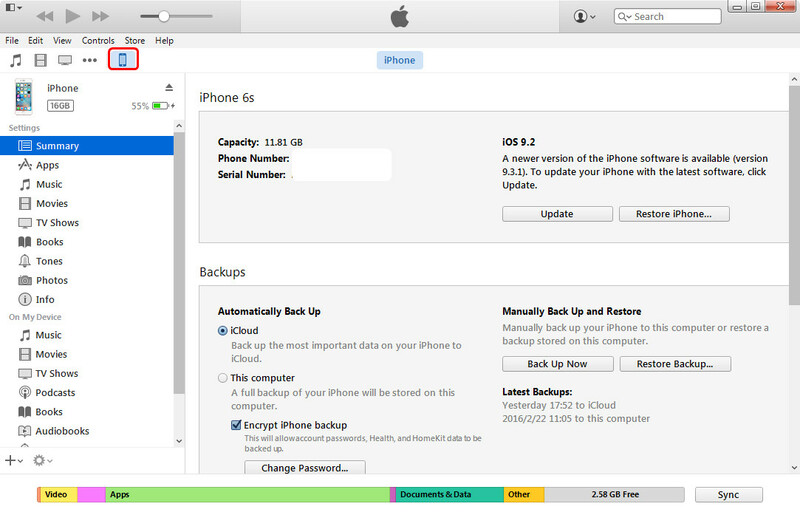 Connect your new iPhone to iTunes following the step 2. Click on your iPhone, click the “Tones” to open the ringtones tab. Check the box for “Sync Tones” and then check the boxes for the ringtones you want to sync. There are 2 options avaliable, check “All tones” to choose all the ringtone files to sync, or check “Selected tones” to select the specified ringtones that you want to transfer. Finally click “Sync” button in the bottom right corner of iTunes, it will start transferring ringtones from iPhone to iPhone via iTunes. 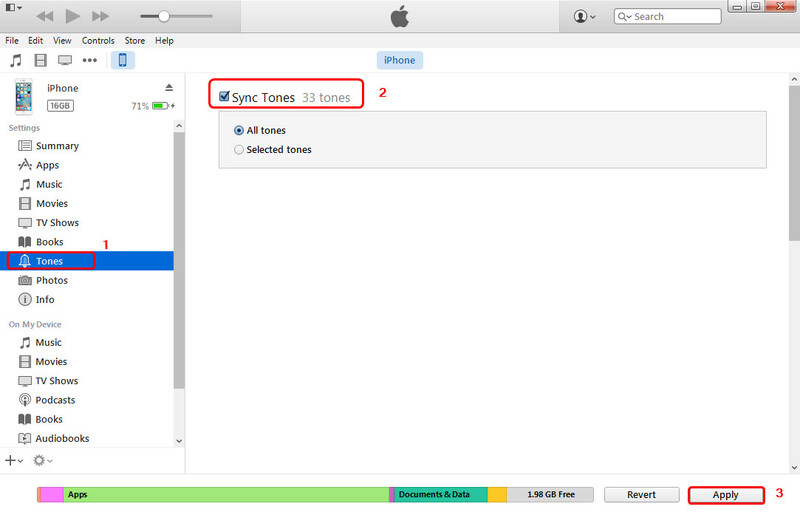 The synced ringtone files will appear on your iPhone as a ringtone automatically. If you want to transfer ringtones from iPhone to iPhone with no efforts, you can take advantage of the third-party iPhone transfer software. The following guidance will show you how to transfer customized ringtones from iPhone to iPhone, and you are allowed to free download the software to have a try. Note that the trial version has limited transfer times. 1. Run Leawo iTransfer and connect the iPhones to computer with the USB cables. The software will automatically detect the libraries of both iDevices, and then show the libraries in the left sidebar. 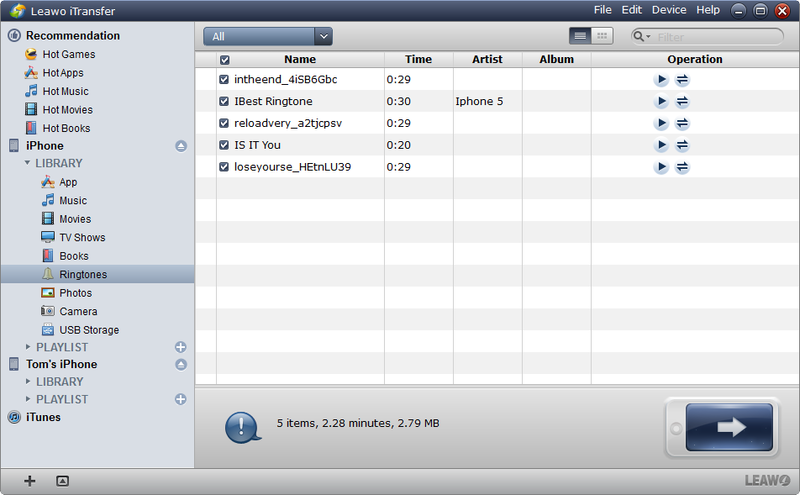 Choose the “Ringtones” library of the old iPhone, and then the contents will be shown in the right part. 2. Click the transfer button to transfer all ringtones from iPhone to iPhone. Or hold “Ctrl” key and click to select certain ringtones, and then right-click the chosen ringtones to “Transfer to > iPhone”. 3. The dialog of transfer settings will pop up after the transfer button is clicked. Check “Transfer to List” in the dialog, and then choose “iPhone” in the drop-down menu. 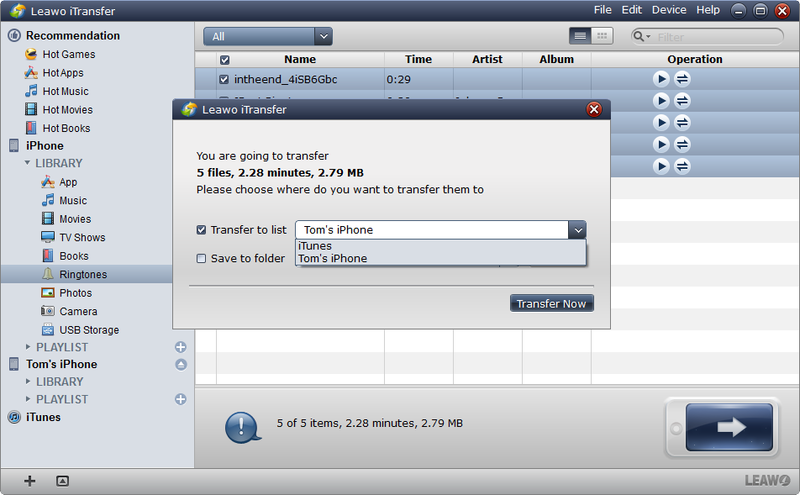 Then click “Transfer Now” at the right bottom to start transferring ringtones from iPhone to iPhone. 4. 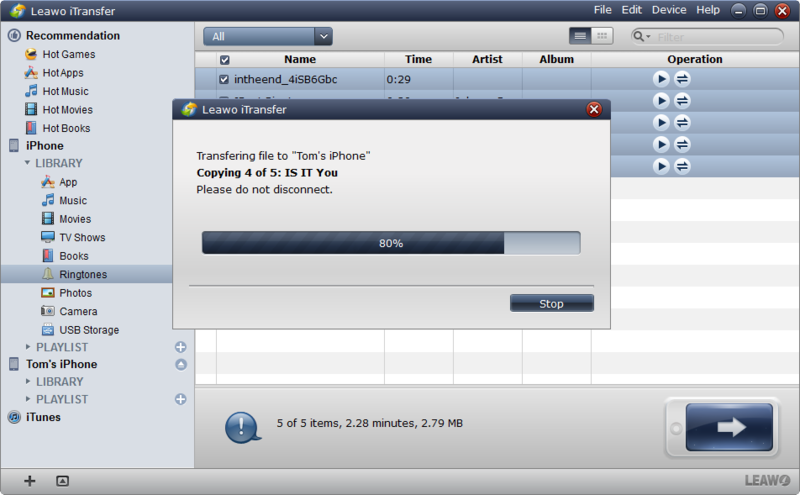 When the ringtone transfer is ongoing, a progress bar will show you the percentage of the transfer process. The transfer will be finished in short time, and you will get the transferred ringtones in your new iPhone when the transfer is done. Leawo iTransfer is an easy-to-use yet powerful transfer program from iOS devices, and it enables users to transfer files among iOS devices, iTunes and PCs without the sync of iTunes. The table below is about the supported transferred files, iOS devices, Windows versions by Leawo iTransfer. Files apps, music, movies, TV shows, ringtones, podcasts, voice memos, ebooks, photos, Camera Roll, contacts and text messages, etc. 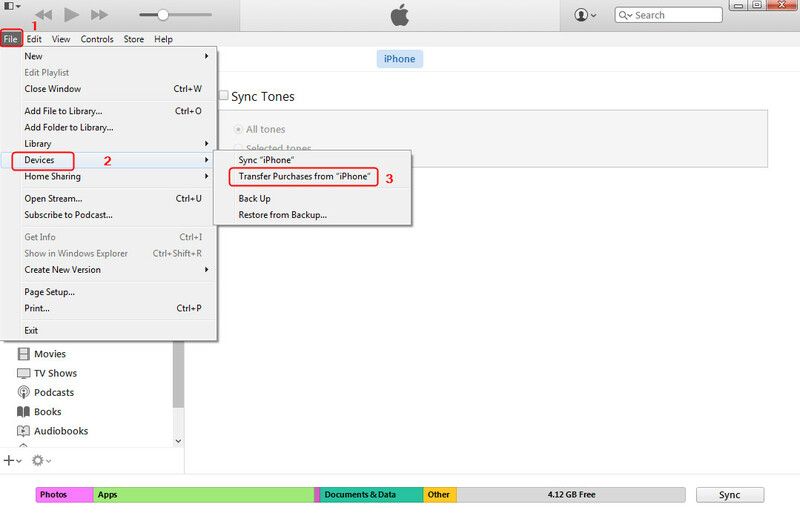 If the users transfer ringtones with the “Transfer Purchases” function of iTunes, they will probably lose the customized ringtones in their iPhone. Many users may have come up with this problem, and want to figure out a way to get the files transferred, such as transferring customized ringtones from old iPhone to new iPhone. In fact, you can take advantage of Onedrive to transfer ringtones from iPhone to iPhone if you are using a Windows computer. You only need to install this cloud service on your iPhones and computer, and then sync the ringtones between your old iPhone and the new iPhone, then download the music files to your computer. 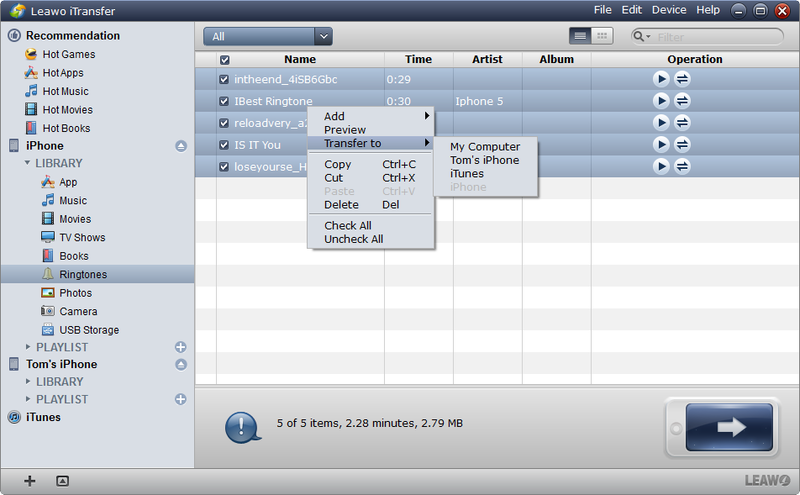 When the ringtones are on your computer, you will be able to use iTunes to sync the ringtones to new iPhone. Or you can sync the ringtones between the two iPhones with Onedrive, but you may need to use Wi-Fi connection to download the ringtones.